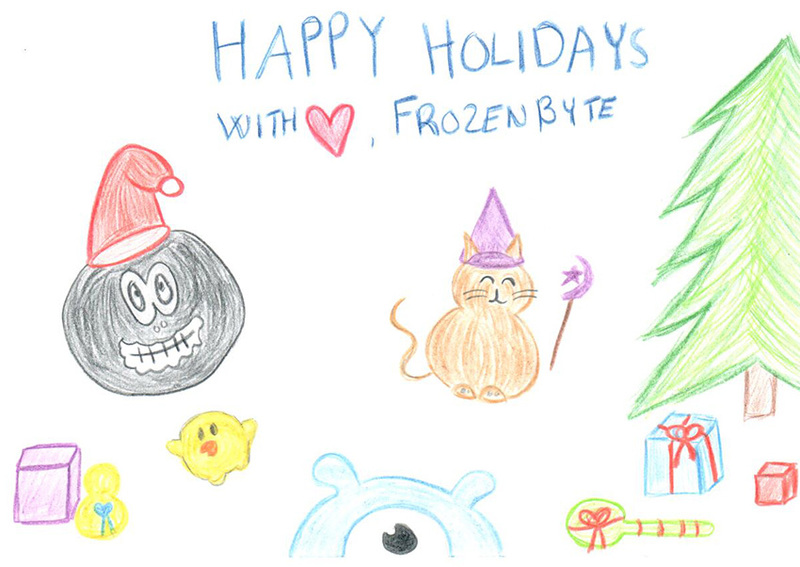 Frozenbyte Christmas Calendar, Day 24! Today you have a better chance to win codes for our games. As usual, you can win a Frozenbyte game key of your choosing for Steam by commenting below. But besides that we have a contest. Just draw or take a photo of something related to our games. We’ll hand out a few game keys randomly among the participants. You don’t need any skills to participate, but there is a reason why you should make an effort: the winner will get a Frozenbyte Collection for Steam, it includes all of our games that have been released up until this point. Plus we will send the winner a Trine T-shirt! Contest lasts from Saturday December 24th until Sunday January 1st. ● Keep your entries appropriate for all ages! 2. Share your work of art! 3. The winner gets a price! ● We’ll pick the winner based on the nicest or funniest idea – so don’t be afraid to participate even if you don’t have much experience from drawing or taking photos. The winner will get a Frozenbyte Collection and a T-shirt! ● We’ll also have a lottery between all the participants to win a Frozenbyte game key of their choice! As you can see, no skills needed to participate! Happy Holidays to all! Eat well and play a lot of video games! I may have to cook up something then. Great, I will post something on Twitter later. Thanks ! Very fun idea! My girls love to draw … Maybe they can get something going, since I’m rubbish at art. Seems like Splot read my yesterday’s comment and wants us to draw something too. 😀 Unfortunately I don’t have any ideas yet, but there is still 1 week left to participate. Merry Christmas and Happy Holidays to all, it really was fun to read something new every day. Do you know the hour it will be available? Fixed, time to get your copy from the App Store. Who’s the winner of this contest? Oh sorry. I did not read the instructions carefully.